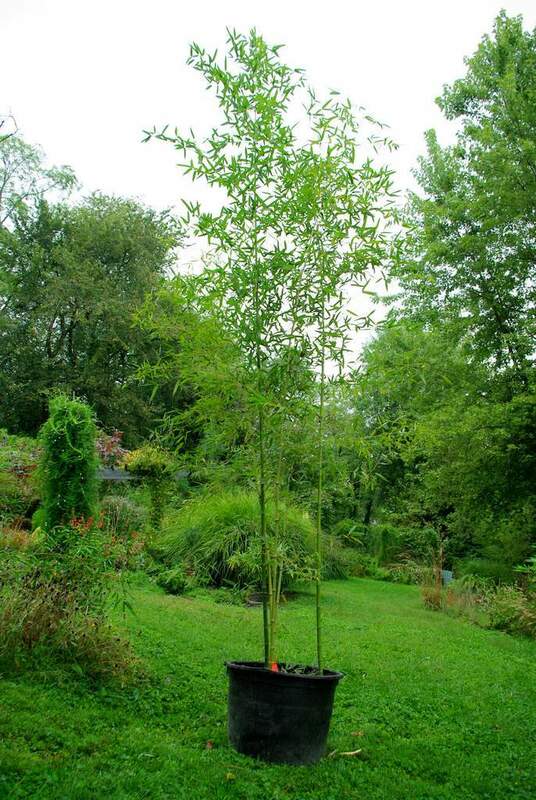 As I mentioned yesterday, one of the reasons that I visited Needmore Bamboo in Indiana was to purchase a large potted bamboo that Brad was holding for me. 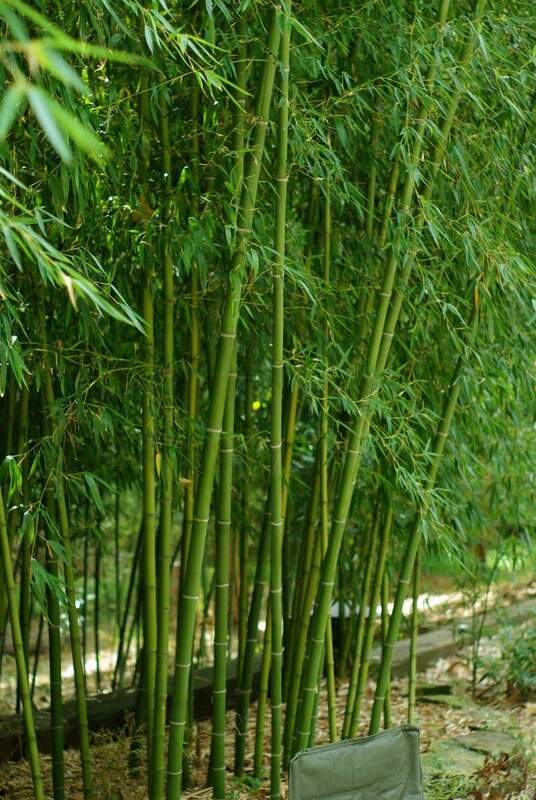 The great thing about large bamboos in pots is that they provide immediate impact -- there's no waiting for a few years. The thing to remember is that when I get it home I only have one person (myself) to unload it. This 25 gallon nursery pot is about the limit of what I can handle myself, but luckily gravity is around to help out. In this case it was pretty easy to get the plant down onto the dolly, and since I left the truck in the street instead of backing it down the driveway, it was a straight shot downhill to where I wanted to put the pot. 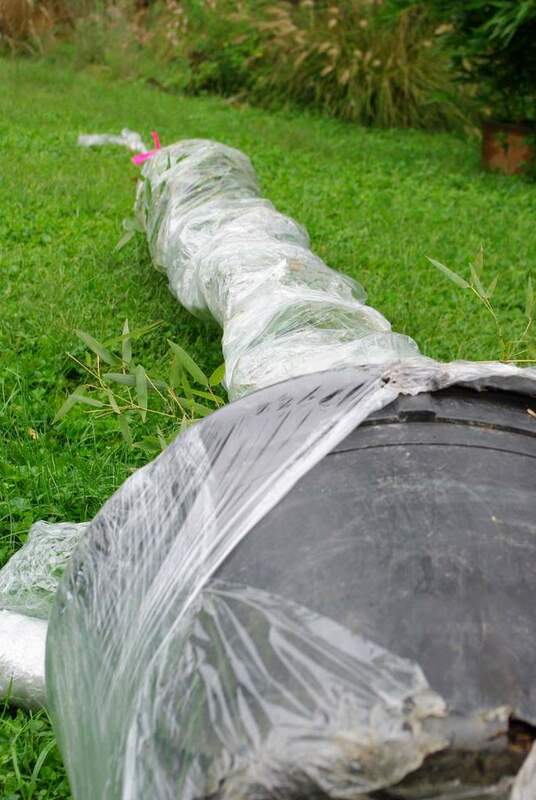 The plant is wrapped in stretch wrap -- the stuff they use for wrapping and securing shipments of all kinds. 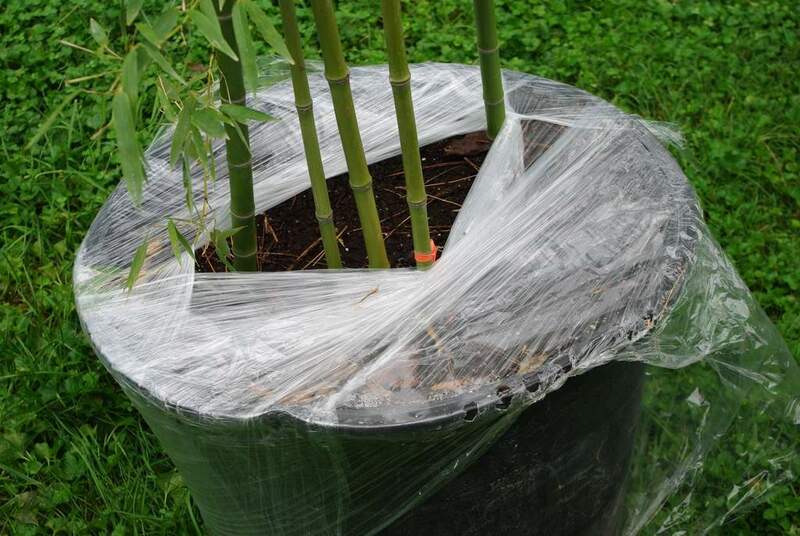 Since the bamboo branches are quite flexible and sturdy (you can't do this too soon after the new shoots branch out -- you need to wait until they harden), you can just wrap as tightly as you want. This is really a great way to protect the plant during it's 4.5 hour trip from Indiana back to St. Louis. You wouldn't want to leave the plant unwrapped, as the highway-speed winds would quickly dry out the leaves, stressing the plant severely. 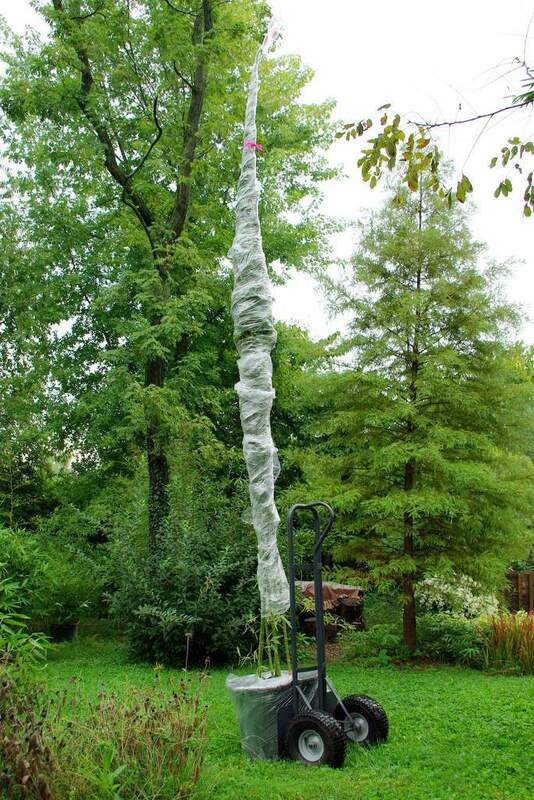 The whole thing looks like something Dr. Suess would enjoy planting, doesn't it? I also wrapped the bottom of the pot to keep the potting mix from spilling out. It turned out to be unnecessary because all of the soil stayed in place, but I'd rather be safe than sorry. 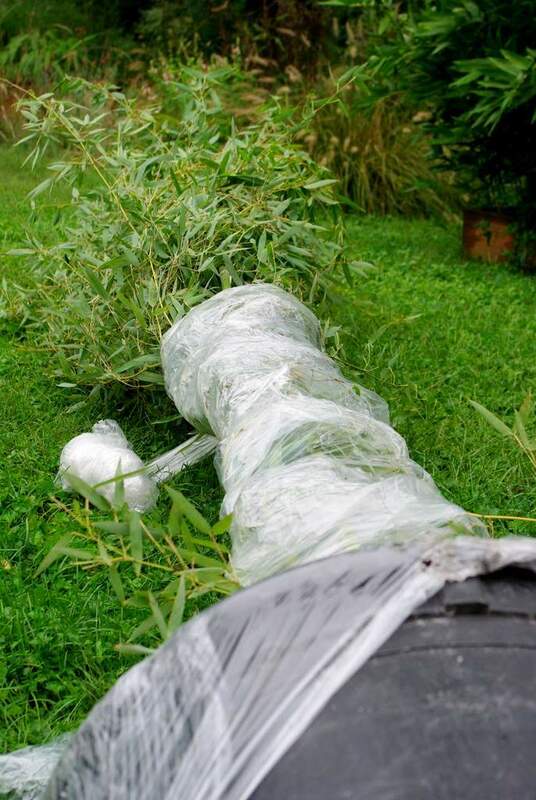 Then I laid the plant back down and started unwrapping it. The one downside to using the stretch wrap is that it's almost impossible to reuse, so this will need to go into the trash once I remove it from the plant. 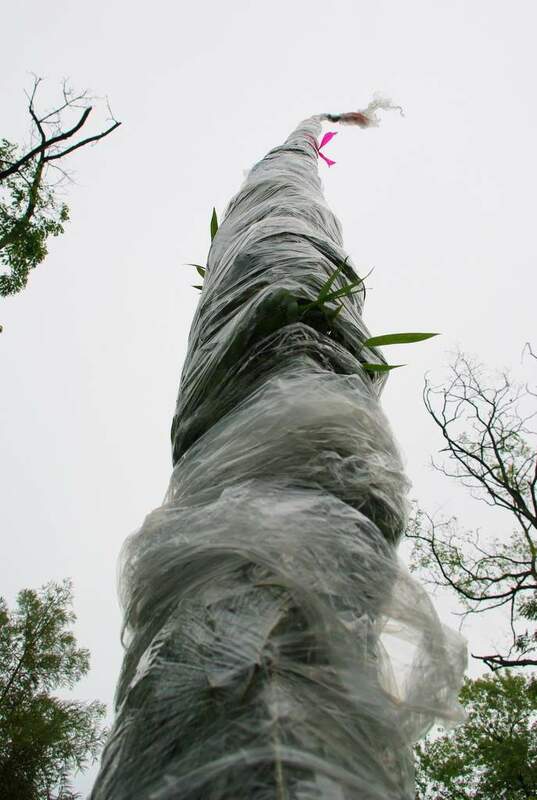 Once it's all unwrapped I just had to untangle a couple of branches, then stood the plant back up and removed the wrap around the pot. 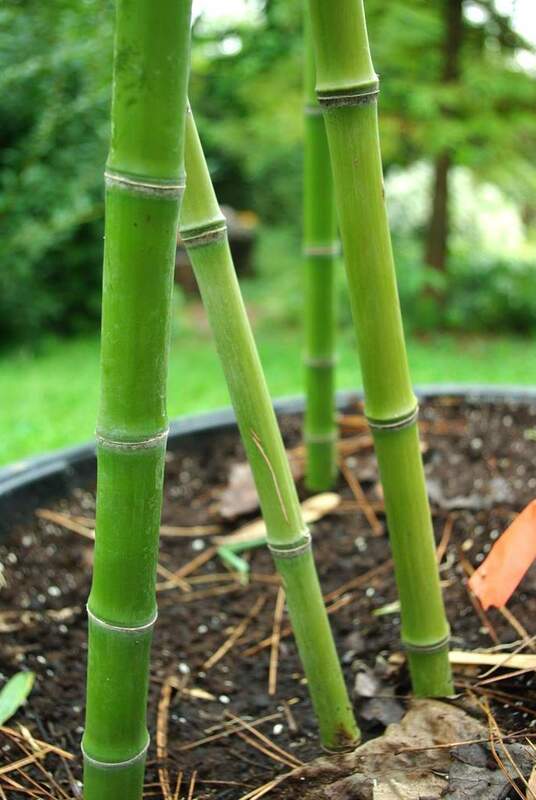 In a couple of years or so when the plant starts producing thicker culms it will be really impressive. One thing I love about buying plants from Brad is that he lets them get well-established in the pots, usually digging them then growing them in the pots for a full year. The end result is that you have a plant that establishes and sizes up quite quickly -- at least that's been my experience. 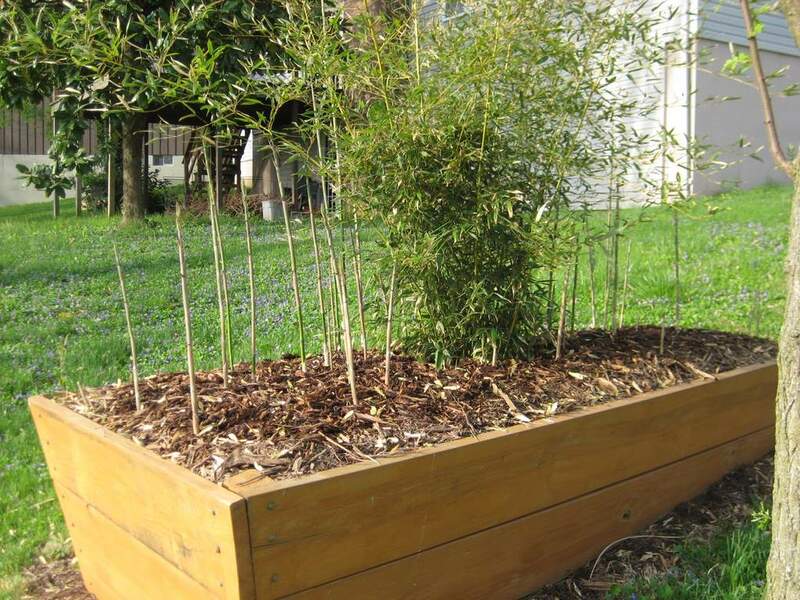 I'm going to dismantle this raised bed (this is an old photo), remove the bamboo from it, and plant the new bamboo in its place. I was thinking about tackling that this week, or this weekend at the latest, but the temperatures are forecast to be near 90 F all week, and I'd rather do this project when it's a bit cooler than that. Stay tuned for that one -- it's going to be a tough project!